Will China decide to reduce tension in the South China Sea? On May 19, The Straits Times published an article written by Xu Bu, China's Ambassador to Asean, that criticises US involvement in the South China Sea ( "US 'rebalancing' is fishing in S. China Sea's troubled waters"). Ambassador Xu accused the United States of being the "driving force" behind increased tensions in the region, but his rhetoric is based on faulty assumptions and misinterpretations of the facts and the law. Mr Xu suggests that after US secretary of state Hillary Clinton visited the region in 2009, the region "evolved into a disturbing... hot spot", and that her visit encouraged states to change their policies to confront China. But China's problems in the South China Sea were created by conscious decisions in Beijing to insistently use coercion to advance its expansive and unlawful claims, alarming China's neighbours. And the Philippines and Vietnam clarified their claims in the South China Sea not because of Mrs Clinton's visit, but to comply with international law - something China might well consider for itself. The Philippines did not enact a new baseline law in March 2009 "to claim sovereignty over... Huangyan Island (Scarborough Shoal) and some of the Nansha (Spratly)Islands". In fact, Republic Act 9522 was passed to bring the Philippines' archipelagic baseline system into full compliance with the United Nations Convention on the Law of the Sea. Philippine sovereignty over Scarborough Shoal can be traced back to 1800, when the Philippine-based Spanish frigate Santa Lucia surveyed the shoal. Colonial Spain, and later the US, effectively administered the shoal and its surrounding waters until the Philippines gained its independence in 1946. Philippine claims to the Spratlys' Kalayaan Island Group (KIG) date back to 1956; the KIG was formally annexed by Philippine Presidential Decree No. 1599 in 1978. Similarly, Mr Xu asserts that Vietnam's May 2009 submission to the Commission on the Limits of the Continental Shelf, in which Hanoi claimed an extended continental shelf in the South China Sea and reaffirmed its sovereignty over the Paracel and Spratly islands, was somehow linked to Mrs Clinton's visit. In fact, Vietnam submitted its claim on May 6 and 7 in order to meet the UN-established deadline - May 13, 2009. Vietnam's title to the Paracel and Spratly islands is well founded in history and law. Vietnam exercised peaceful, effective and continuous administration of the Paracel Islands from the early 18th century until 1974, when Vietnamese forces were ejected in a short, bloody attack by China - a violation of Article 2(4) of the UN Charter. Similarly, Vietnamese sovereignty over the Spratlys can be traced to French annexation and peaceful occupation of the archipelago in the 1930s. Taiwan's illegal seizure of Itu Aba Island in 1956 and China's invasion of the Spratlys in 1988 violate Article 2(4) and do not confer lawful title to the Spratlys to either nation. The wedge between China and Asean with regard to the South China Sea emerged from China's end to its "peaceful rise", as it turned towards coercion to bully its neighbours. Noteworthy examples of Chinese aggression include - harassing Vietnamese and Philippine seismic survey ships by cutting their seismic cables and threatening use of force (2011-2012); preventing Vietnamese and Filipino fishermen from pursuing their livelihood in their own exclusive economic zone (EEZ) by ramming and sinking their boats (2014-2016); seizure of Scarborough Shoal (2012) and Jackson Atoll (2015); conducting military exercises on James Shoal (2013-2014); interfering with the humanitarian resupply of Filipino marines aboard the BRP Sierra Madre at Second Thomas Shoal (2014) - a submerged feature on the Philippine continental shelf; conducting oil exploration with the deepwater oil rig Haiyang Shiyou 981 in Vietnam's EEZ (2014-2016); construction of massive, mid-ocean artificial islands (2013-2016); establishing military installations and radar sites on them, and building airstrips on the features capable of accommodating every military aircraft in the People's Liberation Army (PLA) inventory (2015-2016); and stationing surface-to-air missiles in the Paracels in order to expand its anti-access/area denial envelope (2016). China took all of these actions and more despite its obligation to comply with the 2002 Declaration on the Conduct of Parties, in which the parties pledge to exercise self-restraint in conducting activities that could complicate or escalate disputes and affect peace and stability, and to refrain from action of occupying presently uninhabited features. While all South China Sea claimants reclaimed land to artificially enhance islands in the region, the speed and scale of China's campaign, combined with aggressive policing of its extravagant nine-dash line claim, have inspired fear. Since December 2013, China has reclaimed more than 1,295ha of artificial territory. By comparison, Vietnam has reclaimed approximately 32ha; Malaysia, 28ha; the Philippines, 6ha; and Taiwan, 3ha. In other words, China has reclaimed 17 times more artificial land in two years than the other claimants combined over the past 40 years, which accounts for nearly 95 per cent of all reclaimed land in the Spratly Islands. Mr Xu also claims Washington encouraged the Philippines to abandon bilateral negotiations with China in favour of litigation at the Permanent Court of Arbitration. 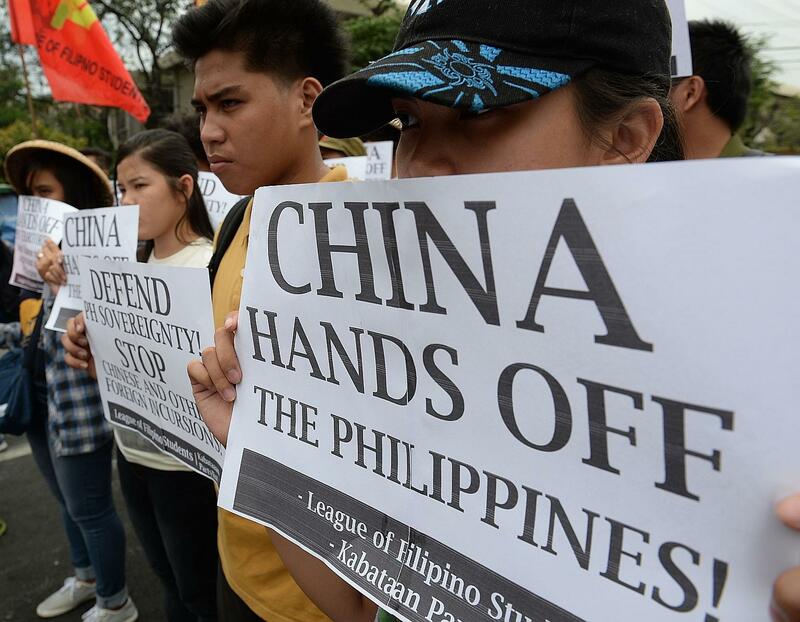 The Philippines, however, neither sought nor needed US approval, and was driven by its own frustration over 20 years of failed bilateral consultations and negotiations with China. The tribunal concurred, noting that "despite years of discussions aimed at resolving the... disputes, no settlement has been reached. If anything, the disputes have intensified". The Ambassador suggests that the US fabricated a threat to freedom of navigation and overflight, which he claims has never been at risk in the South China Sea. Since 2001, however, Chinese ships and aircraft have conducted countless provocative, dangerous and unprofessional challenges and intercepts of US surveillance/ reconnaissance aircraft (such as EP-3 incident 2001, P-8 incident 2014, EP-3 incident 2016); US warships (such as USS John S. McCain 2009, Cowpens 2013, Chancellorsville 2016); and US military survey ships (such as USNS Bowditch 2001/2008, Sumner 2002, Impeccable 2009/2013, Victorious 2009). China has also issued grave warnings to Indian warships (INS Airavat 2011 and Shivalik 2012) and Australian surveillance aircraft and warships (2015-2016) exercising high sea freedoms in the South China Sea. Ironically, China is completely hemmed in by neighbouring EEZs, and the PLA Navy operates freely in its neighbours' EEZs, as well as conducts spying in the US EEZ off Hawaii and Guam. The US is a treaty alliance partner with five nations in the region - Australia, Japan, the Philippines, South Korea and Thailand. Ambassador Xu claims that these long-standing relationships are militarising the region. But American naval force levels and those of its allies are essentially unchanged for 20 years. Over the past five years, the US transferred three repurposed US ships to the Philippine Navy - BRP Gregorio del Pilar (2011), Ramon Alcaraz (2013) and Gregorio Velasquez (2016), while China launched three new warships in a single day last year! Likewise, the recent agreement between the US and the Philippines to permit American forces occasional access to a handful of Philippine bases is part of the modest rebalance that arose after 15 years of breathtaking increases in the quality and quantity of Chinese warships and military aircraft. The economic prosperity of the people of South-east Asia is best assured by the peace and security of enduring partnerships between the United States and its friends and allies, and a commitment by all states to a rule-based order in the world's oceans. If China is indeed a "strong supporter of a rule-based international order", as the Ambassador claims, then Beijing has to act as though international law binds and restrains powerful states as well as the weak. Until that occurs, China will never win the respect of those responsible nations who truly seek peace and prosperity in the Indo-Asia Pacific region. •Raul Pedrozo is a non-resident scholar in the Stockton Centre for the Study of International Law at the US Naval War College. James Kraska is a professor in the centre.